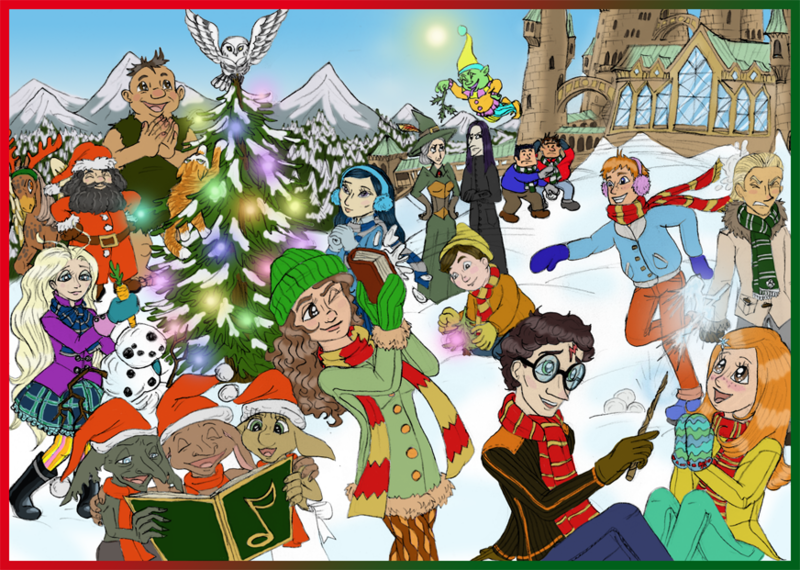 There’s no better place to spend the holidays than in the wizarding world! From the wonderfully spooky Halloween feast at Hogwarts to the hilarious time that Lockhart dressed up dwarves as Cupid for Valentine’s Day, the Harry Potter books have given us some memorable holiday moments. Out of all these magical moments, Christmas has some of the best. For this reason, we’re looking at the best places in the wizarding world to spend the winter holiday this year! Imagine being invited to a Weasley family gathering! The house will be toasty warm and full of pleasant company. Arthur Weasley will spend the holiday talking about Muggle contraptions, Molly will ply you with food, and the twins will ask you to assist in their latest prank. If you’re lucky, you might even get a Weasley sweater! If you’re looking for a casual, familial Christmas celebration, then the Burrow is the ideal place to spend the holidays. Hogsmeade is full of holiday cheer with the Christmas carolers and humongous fir trees stuffed in the Three Broomsticks Inn. It’s a fun place to visit during the winter holidays since you can shop for gifts and stay warm in the snug shops. There’s a variety of shops for everyone to explore, from Honeydukes to Zonko’s Joke Shop. Hogsmeade is more than just a series of stores. It’s a rustic village with plenty of places to relax and try delicious treats! I’ve always wished that Shell Cottage were featured more prominently in the books. For the brief time the trio stayed at the cottage, it became a safe and welcoming place for our favorite characters. I like to think that after the war, Shell Cottage became a happy place. Hopefully, Bill and Fleur still live there and the Weasleys come and visit them. This would be a lovely location to host future Christmas dinners and Fleur would be a confident and lovely hostess. When Harry and Hermione visit Godric’s Hollow, it is a somber time. However, even though Harry didn’t spend his childhood there, the village is still an idyllic and charming place to visit. The winter holiday is when the village is on display. Snow is falling everywhere and there are historic spots for wizards to visit. So many important figures in wizarding history were associated with Godric’s Hollow, so making a trip is all the more worth it! The oldest pub in London has always been prominently featured in the Harry Potter series. When Harry and his friends frequent Diagon Alley, they always stop at the Leaky Cauldron. It was one of the first magical places Harry ever visited, so it’s a place that gives me all the nostalgic feelings. It has a lively atmosphere and usually an odd character or two sitting at the bar. It’s the perfect place to stay overnight if you want to stay a couple of days in Diagon Alley. You can hang out with friends and grab something to eat. If you don’t have any plans over the winter holidays, consider visiting Diagon Alley and staying at the Leaky Cauldron! Hagrid isn’t the best cook and there is no end to the strange creatures inhabiting his hut, but that doesn’t mean your visit can’t be enjoyable! As long as you steer clear from his festive cooking, you can’t spend the holidays with more pleasant company. You and Hagrid could share a pot of tea, gossip about Hogwarts life, and maybe even take a snowy walk through the grounds. Bonus, Hagrid gives the best gifts! No doubt you’d receive a thoughtful, unique gift from the kindly groundskeeper. Even though all the locations we’ve listed are ideal places to spend the holidays, Hogwarts goes above and beyond. There are numerous places within the castle to spend your time! Imagine curling up with a book during a snowstorm in the Hogwarts library, warming up by the fire in your common room, or feasting in the Great Hall. Spending Christmas at Hogwarts is almost as lovely as Christmas at home. Christmas is a common holiday described in novels, but J.K. Rowling creates amazing life and vibrancy in her stories of wintertime at Hogwarts. Most of us Muggles would give anything to visit Hogwarts during the winter holidays!